Of all the awesome historical groups in gaming, there’s no question that vikings have gotten the short end of the svärd. Ninja fans have Revenge of Shinobi or the recent Strider reboot for all their kunai tossing needs, pirate fans have seafaring adventures like Assassins Creed IV and Sea of Thieves to sate their lust for booty – even fans of those sissy cowboys can live out their horsey dreams with Red Dead Redemption. What can viking lovers point to as their magnum opus? The Lost Vikings’ pansy puzzles? The Banner Saga’s turn-based tomfoolery? Alas, those naughty Norsemen have been done dirty by video game developers for too long! Enter Volgarr the Viking, an epic action-packed platformer from the appropriately named Crazy Viking Studios. The game wastes no time getting you right into the action as Volgarr is immediately thrust into battle with nary a title screen or options menu to be found, much like the beloved beat-em-ups of yore. After all, no true viking would be caught dead fiddling with brightness settings or turning on subtitles when there are foes to vanquish! Even the tutorials are minimal, only telling you what to do when you’ve spent too much time fumbling around without naturally figuring something out. Not that you really need a tutorial, since the gameplay is about as simple as it gets (perfect for those of us with precious little space in our brains for anything but eat, sleep, kill, and root for Minnesota). Our hero Volgarr can walk, double jump, roll, swing his sword, and throw a spear. The brutish barbarian’s moveset stays consistent throughout with a straightforward focus on honing your limited skill set, and the only power-ups available can be found in chests which provide Volgarr with progressively better armor and weaponry should he manage to avoid losing any of it by taking damage, which is easier said than done given the relentless difficulty. Like Castlevania you must commit to Volgarr’s jump and momentum once in the air, and though the platforming is usually simple enough, even the most basic of leaps becomes a challenge when you have to worry about the enemies lurking in every corner. Skeletons who block your attacks, sword-slinging zombies able to lunge at you upon death, and spiders that drop from the ceiling are just a few of the accursed creatures that are constantly appearing and almost always placed in the most annoying positions possible. Yet as cheap as it all may seem at first, nothing ever truly feels unfair. Enemy patterns are consistent and even the obvious “gotcha” moments are hard to get upset at when there’s so little penalty for dying. Each world has a mid-level checkpoint and there’s no lives system to worry about, so you’re free to fail without fear of needing to restart from the beginning like in the old days. Fans of tough-as-nails coin-op classics like Rastan and Ghosts ’n Goblins will feel right at home with this game – quite literally in the case of the former, as the beginning of Volgarr’s first stage is ripped straight from Rastan right down to the lizard men and lone destructible block in the floor. A straight playthrough will take you through six bone-crunchingly difficult levels, but the game also features additional hidden paths for the truly dedicated. After each boss you’ll be dropped back into a small room where you can view your treasure hoard and enter the next level, but should you manage to complete the previous level without dying even once, a secret Valkyrie level will open – essentially a remixed version of one of the standard levels, but with limited lives based on how many orbs you picked up from chests in the previous level. Reaching the end of the Valkyrie path will unlock the game’s final level, and while I suspect many will be content simply managing to reach the basic ending, completionists will definitely find that they get more out of the game the more they put into it. Speedrunners are catered to as well, with a dedicated speedrun HUD that shows timers for both individual levels and your overall run, easy-to-access records of your fastest times (though sadly no online leaderboard support in this version), and even an achievement for beating every level in just 4 minutes each, a seemingly impossible feat that will surely make even the mightiest of warriors quake in their boots. Though it’s hard to find fault with any of the finely-tuned hack ’n slashing, on an audiovisual level Volgarr is merely serviceable at best. Like its arcade inspirations the game opts for a pixelated look, but the spritework feels amateurish and uninspired. The music takes a more modern approach yet still offers little in the way of memorable melodies, and in an era where more and more indies are pushing the envelope in the way of graphics and sound, I can easily see this viking being overlooked. However, at the end of the day gameplay is king, and in that respect Volgarr might as well be royalty. 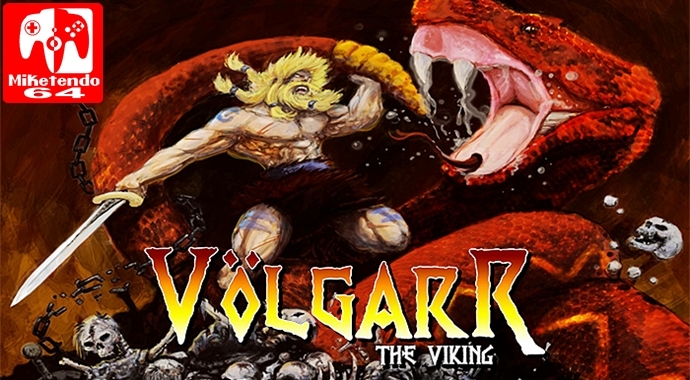 Harkening back to quarter-munching 80’s arcade games, Volgarr the Viking offers a stiff challenge that’s strictly for action-platformer veterans. Despite its pedestrian presentation, fans of the genre will find it hard to resist Volgarr’s unforgiving difficulty and rewarding skill-based gameplay.